The first census since Bosnia and Herzegovina became an independent country was not taken until 2013 and as a result, for many years Sarajevo's population was not known clearly and statistics were based on estimates contributed by the United Nations Statistics Division and the Federal Office of Statistics of the Federation of Bosnia and Herzegovina, among other national and international non-profit organizations. As of June 2011, the population of the city's four municipalities was estimated to be 411,161, whereas the Sarajevo Canton population was estimated at 578,757. With an area of 1,280 square kilometres (490 sq mi), Sarajevo has a population density of about 2,173 inhabitants per square kilometre (5,630/sq mi). According to these estimates, the Novo Sarajevo municipality is the most densely populated part of Sarajevo with about 7,524 inhabitants per square kilometre (19,490/sq mi), while the least densely populated is the Stari Grad, with 2,742 inhabitants per square kilometre (7,100/sq mi). ^ "Wayback Machine" (PDF). 6 September 2015. Archived from the original (PDF) on 6 September 2015. Retrieved 14 August 2018. ^ "Things to do in Sarajevo". Gezip Gördüm. 28 August 2018. Retrieved 11 November 2013. ^ Ronelle Alexander (15 August 2006). Bosnian, Croatian, Serbian, a Grammar: With Sociolinguistic Commentary. Univ of Wisconsin Press. p. 2. ISBN 9780299211936. ^ "Weather and Climate: The Climate of Sarajevo" (in Russian). Weather and Climate (Погода и климат). Archived from the original on 16 May 2012. Retrieved 25 August 2016. ^ "Sarajevo Climate Normals 1961–1990". National Oceanic and Atmospheric Administration. Retrieved 25 August 2016. ^ "Air Pollution is Choking Bosnia, Experts Warn :: Balkan Insight". www.balkaninsight.com. Retrieved 4 April 2017. ^ "Bosnia: Sarajevo schools close down because pollution". Mail Online. Retrieved 4 April 2017. ^ "Sarajevo introduces transport restrictions to ease pollution". Fox News. 26 December 2016. Retrieved 4 April 2017. ^ Group, US EPA National Center for Environmental Assessment, Research Triangle Park Nc, Environmental Media Assessment; Sacks, Jason. "Integrated Science Assessment (ISA) for Particulate Matter (Final Report, Dec 2009)". cfpub.epa.gov. Retrieved 4 April 2017. ^ "Federalni hidrometeorološki zavod". www.fhmzbih.gov.ba. Retrieved 4 April 2017. ^ "Commission to preserve national monuments". 13 October 2007. Archived from the original on 13 October 2007. Retrieved 14 August 2018. ^ "BiH Tourism Assessment – Analysis of Sarajevo, Herzegovina and Krajina Tourism Regions and Recommendations for Product Development, Marketing and Destination Management |Expo". Exportcouncil.ba. Retrieved 5 April 2012. ^ European Commission & World Bank. "The European Community (EC) Europe for Sarajevo Programme". Archived from the original on 6 November 2007. Retrieved 26 July 2006. CS1 maint: BOT: original-url status unknown (link) The EC reconstruction programme for Bosnia and Herzegovina detailed by sector. Retrieved on 5 August 2006. ^ "Kanton Sarajevo: Više turista u 2011". Vijesti.ba. Retrieved 12 March 2013. ^ "Statistički Godišnjaci/Ljetopisi". Fzs.ba. Retrieved 12 March 2013. ^ "Chasing the Olympic dream". cloudlessness. Retrieved 6 April 2018. ^ "Omladinski filmski festival Sarajevo predstavlja nove mlade autore". Al Jazeera Balkans. 4 July 2017. The 1973 World Table Tennis Championships were held in Sarajevo from April 5 to April 15, 1973. The assassination of Archduke Franz Ferdinand of Austria, heir presumptive to the Austro-Hungarian throne, and Franz Ferdinand's wife Sophie, Duchess of Hohenberg, occurred on 28 June 1914 in Sarajevo when they were mortally wounded by Gavrilo Princip. Princip was one of a group of six assassins (five Serbs and one Bosniak) coordinated by Danilo Ilić, a Bosnian Serb and a member of the Black Hand secret society. The political objective of the assassination was to break off Austria-Hungary's South Slav provinces so they could be combined into a Yugoslavia. The assassins' motives were consistent with the movement that later became known as Young Bosnia. The assassination led directly to World War I when Austria-Hungary subsequently issued an ultimatum to the Kingdom of Serbia, which was partially rejected. Austria-Hungary then declared war on Serbia, triggering actions leading to war between most European states. In charge of these Serbian military conspirators was Chief of Serbian Military Intelligence Dragutin Dimitrijević, his right-hand man Major Vojislav Tankosić, and the spy Rade Malobabić. Tankosić armed the assassins with bombs and pistols and trained them. The assassins were given access to the same clandestine network of safe-houses and agents that Malobabić used for the infiltration of weapons and operatives into Austria-Hungary. Fudbalski klub Sarajevo (English: Sarajevo Football Club) is a Bosnian professional football club based in Sarajevo, the capital city of Bosnia and Herzegovina and is one of the most successful clubs in the country. Founded on 24 October 1946, FK Sarajevo was the most successful club from SR Bosnia in former SFR Yugoslavia, winning two Yugoslav First League titles, being runners-up on two other occasions and finishing 6th in that competition's all-time table. The club's official colours are maroon and white. FK Sarajevo was the only major football club founded by the post-war Yugoslav authorities in the city of Sarajevo. The club entered the Yugoslav First League in the 1948–49 season, and eventually competed in all but two seasons in the top tier. After Bosnia and Herzegovina gained independence from Yugoslavia, FK Sarajevo became one the country's biggest ambassadors, departing on a large world tour during the Bosnian War with the goal of gaining international support for the country's cause.Today, FK Sarajevo is one of the most prominent members of the Premier League of Bosnia and Herzegovina, where it has won three Bosnian championships, five Bosnian Cups and one Bosnian Supercup. Furthermore, the club was runners-up in the national championship another six times. It is ranked first in the Premier League of Bosnia and Herzegovina all-time table and is the country's most prominent representative in European competitions. FK Sarajevo is the most popular football club in the country, together with FK Željezničar, with whom it shares a strong rivalry that manifests itself in the Sarajevo derby. The club plays its home matches at the Asim Ferhatović Hase Stadium, named after legendary club striker Asim Ferhatović. The stadium has a capacity of 34.500.Since March 2019, FK Sarajevo is run by Vietnamese businessman Nguyễn Hoài Nam and the PVF Investment and Trading, JSC (Promotion Fund of Vietnamese Football Talents F.C.). Fudbalski klub Slavija Sarajevo (Serbian Cyrillic: Фудбалски клуб Славија Сарајево) is a football club from Istočno Sarajevo, Republika Srpska, Bosnia and Herzegovina. Slavija Sarajevo is a member of the Football Association of Republika Srpska and it is active in the First League of the Republika Srpska. The club's home stadium is Gradski SRC Slavija Stadium. Dominantly the club of Serbs, Slavija was by far the most successful club from Bosnia and Herzegovina during the interbellum, having played 11 top league seasons (out of possible 16) in the Kingdom of Serbs, Croats and Slovenes and Kingdom of Yugoslavia. The only other Bosnia-based club that made it to top national level was Croat-dominated SAŠK (six seasons). Fudbalski klub Željezničar (English: Football Club Željezničar) is a professional football club, based in Sarajevo, Bosnia and Herzegovina. 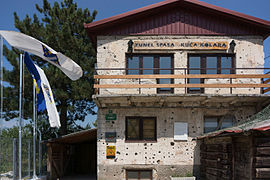 The name Željezničar means "railway worker", from its being established by a group of railway workers. In Bosnia, the club is traditionally known for producing talented players, rather than signing them. The club often sells its most talented players at the end of each season in order to stabilize or increase its finances.During the time of the former Yugoslavia, FK Željezničar were national champions in the 1971–72 season, qualifying the club for the European Cup during the 1972–73 season where they were eliminated in the first round. The club has also finished as runners-up once in the league, as well as playing in a 1980–81 Yugoslav Cup final. In Europe, the club is most famous for reaching both the UEFA Cup semi-finals during the 1984–85 season and the quarter-finals during the 1971–72 season. The club is the first Bosnian team to reach the UEFA Cup semifinals and one of the few teams ever to do so from Yugoslavia. Željezničar is the most successful football team in present-day Bosnia, having won 6 Bosnian championships, 6 Bosnian Cups and 3 Bosnian Supercups. The club has never qualified for UEFA Champions League (post European Cup) as its best finish was the 2002–03 Champions League third qualifying round, losing to Newcastle United 0–5 on aggregate. Their biggest rival is FK Sarajevo with whom they contest the biggest football match in Bosnia and Herzegovina, the Sarajevo derby, in which both teams have similar win-loss records and games ending in ties. According to the IFFHS list of the Top 200 European clubs of the 20th century, an organization recognized by FIFA, Željezničar is the highest ranked Bosnian club, sharing the 110th position on the list with AZ Alkmaar and Vitória de Guimarães. The club has produced many Yugoslav and Bosnian greats, including Ivica Osim, Josip Katalinski, Mišo Smajlović, Blagoje Bratić, Hajrudin Saračević, Josip Bukal, Božo Janković, Mehmed Baždarević, Edin Bahtić, Radmilo Mihajlović, Haris Škoro, Nikola Nikić, Edin Ćurić, Dželaludin Muharemović, Edin Višća, Riad Bajić and Edin Džeko. Gavrilo Princip (Serbian Cyrillic: Гаврило Принцип, pronounced [ɡǎʋrilo prǐntsip]; 25 July 1894 – 28 April 1918) was a Bosnian Serb member of Young Bosnia, a Yugoslavist organization seeking an end to Austro-Hungarian rule in Bosnia and Herzegovina. At the age of 19 years old he assassinated Archduke Franz Ferdinand of Austria and his wife, Sophie, in Sarajevo on 28 June 1914, initiating a chain of events that would lead to the outbreak of World War I. Princip and his accomplices were arrested and implicated the Serbian nationalist secret society known as the Black Hand, leading Austria-Hungary to issue a démarche to Serbia known as the July Ultimatum.Princip said the archduke was targeted because "as future Sovereign he would have prevented our union by carrying through certain reforms", an allusion to the archduke's reputed support for structural reforms of the monarchy that would assign more autonomy to the Slavic lands. This was a threat to the Serbian irredentist project. Princip was a Yugoslav nationalist associated with the movement Mlada Bosna (Young Bosnia) which predominantly consisted of Serbs, but also Bosniaks and Croats. During his trial he stated: "I am a Yugoslav nationalist, aiming for the unification of all Yugoslavs, and I do not care what form of state, but it must be freed from Austria. "Princip died on April 28, 1918, from tuberculosis caused by poor prison conditions that had cost him a limb earlier. Koševo City Stadium, also Koševo Olympic Stadium, also Asim Ferhatović - Hase Bosnian: Gradski stadion Koševo / Olimpijski stadion Koševo / Asim Ferhatović - Hase) is a multi-purpose stadium located in the Koševo neighborhood of Sarajevo, Bosnia and Herzegovina. Koševo Stadium (Bosnian: Koševo) or Olympic Stadium is opened by the city, and leased on longterm basis by FK Sarajevo. The club proposed the new name for its sporting and football events, in honor to its former footballer and club's legend, Asim Ferhatović - Hase. It hosted the opening ceremony of the 1984 Winter Olympics. Currently, it is home to football club FK Sarajevo and the Bosnia and Herzegovina national football team. In Bosnia and Herzegovina the smallest administrative unit is the municipality ("opština/општина" or "općina/опћина" in the official languages and scripts of the country). Prior to the 1992–95 Bosnian War there were 109 municipalities in what was then Socialist Republic of Bosnia and Herzegovina. 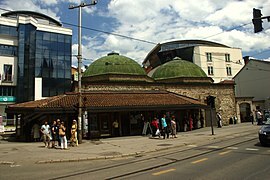 Ten of these formed the area of the capital Sarajevo. 79 municipalities constitute the Federation of Bosnia and Herzegovina (FBiH), which comprises 51% of the country's total territory. The municipalities within the Federation are grouped into ten cantons. 64 municipalities constitute the Republika Srpska (RS), which comprises 49% of the country's total territory.In addition, Brčko District does not belong to either entity and is governed as a condominium of both FBiH and RS entities. The district corresponds to the pre-war Brčko municipality. Although technically not called a municipality, it is treated as such for statistic purposes. Administratively each municipality has a municipality council and a municipality head, and they usually consist of an urban area with the surrounding villages and rural areas around it. Bosnia and Herzegovina also has twentyfour officially designated cities - Banja Luka, Bihać, Tuzla, Mostar, Zenica, Doboj, Prijedor, Bijeljina, Trebinje, Široki Brijeg, Cazin, Goražde, Livno, Zvornik, Gradiška, Živinice, Gračanica, Srebrenik, Gradačac, Visoko, Ljubuški and Čapljina each correspond to a single eponymous municipality. The cities of Sarajevo and Istočno Sarajevo consist of four and six municipalities respectively, which roughly correspond to the ten pre-war municipalities which constituted the capital city. Under the "Law on Territorial Organization and Local Self-Government" adopted in 1994, Republika Srpska was divided into 80 municipalities. After the conclusion of the Dayton Peace Agreement, the law was amended in 1996 to reflect the changes to the entity's borders and now provides for the division of Republika Srpska into 64 municipalities. Novo Sarajevo (Serbian Cyrillic: Ново Сарајево; pronounced [nôʋoː sǎrajeʋo], "New Sarajevo") is a municipality of the city of Sarajevo, Bosnia and Herzegovina. Sarajevo International Airport (Bosnian: Međunarodni aerodrom Sarajevo/Међународни аеродром Сарајево); (IATA: SJJ, ICAO: LQSA), also known as Butmir Airport, is the main international airport in Bosnia and Herzegovina, serving Sarajevo, capital of Bosnia and Herzegovina. It is located 3.3 NM (6.1 km; 3.8 mi) southwest of the Sarajevo railway station and some 6.5 NM (12.0 km; 7.5 mi) west of downtown Sarajevo in the Ilidža municipality, suburb of Butmir. In 2018, 1,046,635 passengers traveled through the airport, compared to 323,499 in 2001. 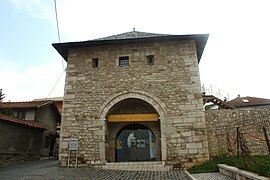 The Siege of Sarajevo was the siege of the capital of Bosnia and Herzegovina, and the longest of a capital city in the history of modern warfare. After being initially besieged by the forces of the Yugoslav People's Army, Sarajevo was besieged by the Army of Republika Srpska from 5 April 1992 to 29 February 1996 (1,425 days) during the Bosnian War. The siege lasted three times longer than the Battle of Stalingrad and more than a year longer than the Siege of Leningrad.When Bosnia and Herzegovina declared independence from Yugoslavia after the Bosnian independence referendum, 1992, the Bosnian Serbs—whose strategic goal was to create a new Bosnian Serb state of Republika Srpska (RS) that would include Bosniak-majority areas—encircled Sarajevo with a siege force of 13,000 stationed in the surrounding hills. From there they assaulted the city with artillery, tanks, and small arms. From 2 May 1992, the Serbs blockaded the city. The Bosnian government defence forces (ARBiH) inside the besieged city, 19 months since start of conflict, numbered some 70,000 troops, were poorly equipped and unable to break the siege. A total of 13,952 people were killed during the siege, including 5,434 civilians. The ARBiH suffered 6,137 fatalities, while Bosnian Serb military casualties numbered 2,241 soldiers killed. The 1991 census indicates that before the siege the city and its surrounding areas had a population of 525,980. There are estimates that prior to the siege the population in the city proper was 435,000. The estimates of the number of persons living in Sarajevo after the siege ranged from between 300,000 and 380,000.After the war, the International Criminal Tribunal for the former Yugoslavia (ICTY) convicted four Serb officials for numerous counts of crimes against humanity committed during the siege, including terror. Stanislav Galić and Dragomir Milošević were sentenced to life imprisonment and 29 years imprisonment respectively. Their superiors, Radovan Karadžić and Ratko Mladić, were also convicted. Stari Grad (Serbian Cyrillic: Стари Град; pronounced [stâːriː grâːd], "Old Town") is a municipality of the city of Sarajevo, Bosnia and Herzegovina. It is the oldest and most historically significant part of Sarajevo. At its heart is the Baščaršija, the old town market sector where the city was founded by the Ottoman general Isa-Beg Isaković in the 15th century. On 23 September 1997, the Irish rock band U2 held a concert at Koševo Stadium in Sarajevo, Bosnia and Herzegovina, as part of the group's PopMart Tour. They were the first major artist to hold a concert in the city after the end of the Bosnian War. Approximately 45,000 fans attended the show. The band first became involved with Sarajevo in 1993 on their Zoo TV Tour; approached by aid worker Bill Carter about bringing attention to the Siege of Sarajevo, the band conducted nightly satellite transmissions with Bosnians during their shows. These link-ups were the subject of criticism from journalists for mixing entertainment with human tragedy. Although the war made it impractical for U2 to visit Sarajevo at the time, they vowed to eventually play a concert in the city. After the conflict ended in November 1995, they made arrangements to visit Sarajevo, and with help from United Nations ambassadors and peacekeeping troops, they scheduled and played the concert in 1997. The band offered to hold a benefit concert or small show in Sarajevo, but it was requested that they stage a full PopMart concert. The performance consequently featured the tour's extravagant stage, and the band played a set list typical of the tour. The show brought together people of different ethnicities who had previously clashed during the war, and train service was temporarily resumed to allow concertgoers to attend. Among the songs played was "Miss Sarajevo", written by U2 and Brian Eno about a beauty pageant held during the war. Although the band were displeased with their performance and lead vocalist Bono had vocal difficulties, the concert was well received and was credited with improving morale among Bosnians. The members of U2 consider the show to be among their proudest moments. The concert was lauded by Bosnians. The University of Sarajevo (Bosnian: Univerzitet u Sarajevu / Универзитет у Сарајеву) is a public university located in Sarajevo, Bosnia and Herzegovina. It is the largest and oldest university in the country, as well as the oldest institution of tertiary learning in the former Yugoslavia, tracing its initial origins to 1537 as an Islamic school of law.With 20 faculties, three academies and three faculties of theology and with 30,866 enrolled students as of 2014, it ranks among the largest universities in the Balkans in terms of enrollment. Since opening its doors in 1949, a total of 122,000 students received bachelor's degrees, 3,891 received master's degrees and 2,284 received doctorate degrees in 45 different fields. It is now widely regarded as the most prestigious university in Bosnia and Herzegovina, and employs more than one thousand faculty members.